A fully updated edition of our successful series to support the Cambridge IGCSE Chemistry syllabus 0620. Written by a team with teaching and examining experience, Cambridge IGCSE Chemistry (fourth edition) gives comprehensive and accessible coverage of the syllabus. 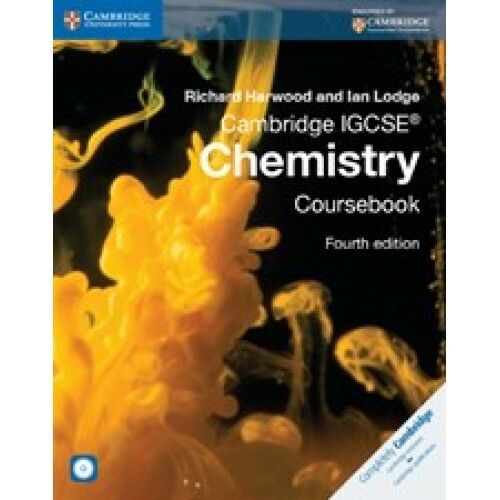 The series components of Cambridge IGCSE Chemistry (fourth edition) work together to cover all required content and skills, including ideas for practicals and other activities that will help to develop experimental skills. The student components are engaging, and accessible to students with a wide range of abilities including those who do not have English as their first language. The Teacher's Resource CD-ROM gives teachers extensive support as well as further resources to use in class. Revision and exam support provided through study tips and practice questions. CD-ROM accompanying coursebook contains a host of revision and practice material designed to help students maximise their chances in their examinations. It also contains answers to the exam-style questions in the coursebook. Workbook helps to develop information handling and problem solving skills, as well as some experimental skills including planning investigations and interpreting results.